Priced at $15.89 on Amazon, this small speaker manages to provide enough sound to pack a small room or outdoor space. 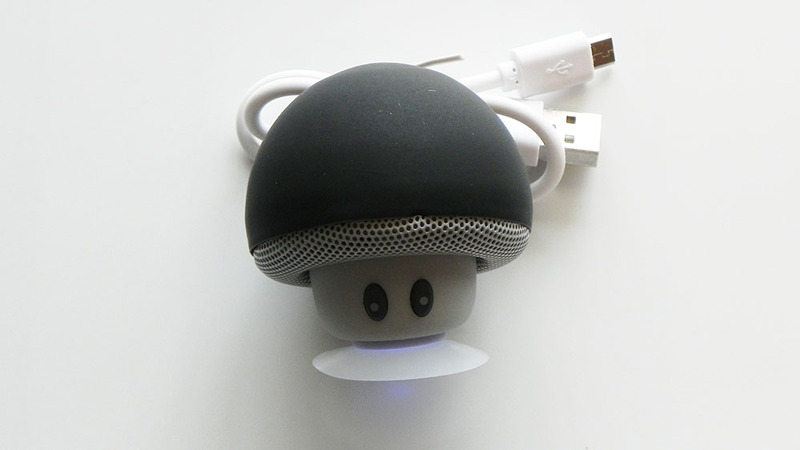 Aside from the mushroom speaker, you do get a white micro-USB cable (for charging the speaker’s integrated battery) and a basic user manual. You may actually want to keep the user manual nearby, as it may not be so obvious as to which button does what. If the black top doesn’t appeal to you, three other colors are available. The speaker also has a suction cup mount on the bottom, allowing you to securely place it on a flat surface, including some smartphones, which effectively enables the speaker to double as a stand. The micro-USB port is located on the back of the speaker, while the microphone is located just below the two front buttons. In regard to the microphone, audio quality from it is very poor, and I simply would not recommend using this feature of the speaker. In total, there are three buttons, each of which handles multiple functions. One button is at the top of the speaker. Hold this one down for a few seconds to turn the speaker on, which automatically enables pairing mode for the Bluetooth function. The two eyes are buttons as well. The left one acts as a previous song button, while the other skips to the next track. Hold down the left eye button to decrease the speaker’s volume, or hold the other to increase it. I recommend leaving the speaker volume to the maximum option, and controlling the actual audio using the device you’re playing from. Audio quality is really quite respectable, given the speaker’s size. It can get loud enough to fill a room or an outdoor entertainment space without distortion. It also has a bit of bass. If you are looking for a small, portable Bluetooth speaker that can get the job done without spending a lot, this is certainly worth taking a look at.